Southern Star Pecans for Sale > Southern Star Pecan Recipes - Our Very Own Pecan Cookbook! Southern Star Pecan Recipes - Our Very Own Pecan Cookbook! Our Price: $6.95 30% off! Our Very Own Pecan Cookbook! 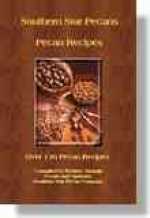 Pecan Recipes - Over 130 pecan recipes in this cookbook compiled by Southern Star Pecans. This e-book is available as a Kindle Book or from Barnes & Noble as a Nook Book. Get you copy today! Purchase this book directly from these distributors and get it instantly!